Spend any time out in the heaving grey waters of the North Sea and you're likely to develop a deep sense of respect for the trawlermen who brave the elements every day to put fish on our plates. But around 1m tonnes of fish are dumped back in the North Sea every year - much of it because catches exceed EU fishing quotas. We had the opportunity to join a Norwegian coastguard ship vessel patrolling the fishing grounds. It was rough and uncomfortable, but from the bridge we could see much smaller Scottish fishing boats being lashed by the waves as they dragged their nets. It is certainly a hard life, but one that is made much harder by the fact that EU rules and regulations mean that as much as half of the fish they work so hard to catch is thrown dead, back into the water. For the Norwegians, who recently filmed a Shetlands-based trawler, dumping some five tonnes of dead fish overboard, it is inexplicable. Norway - which is not part of the EU - has a strict "no discards" policy for its fishing fleet. But UK and other EU vessels are subject to complex rules. "Quotas" limit not the amount of fish that's being caught, but the amount that is landed. As a result, an astonishing amount of fish is being wasted because it is too big, or too small or the skipper is over quota for that particular species. At Peterhead fishmarket, it's clear that fish is a valuable commodity. 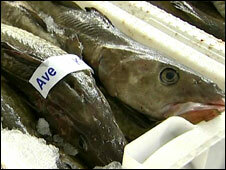 In the early morning chill, hundreds of boxes of cod, hake, haddock and other white fish are bringing good prices. But the fact is that for every box of, say, cod at the market, another box has been dumped, dead, back into the sea. The Scottish Government estimates that one million tonnes of fish is being wasted in this way in the North Sea every year. And now a united front of Scottish fishermen, policy-makers and environmentalists are demanding an end to discards. An industry "summit" in Edinburgh heard Scotland's Fisheries Minister Richard Lochead tell an audience including trawler skippers and environmental groups that the dumping of perfectly good fish was "madness". He said: "I am appalled and frustrated at the scandalous level of waste and the economic and environmental madness discards represent. In what other industry would it be acceptable to throw away so much of what is produced?" Trawler skipper John Buchan told colleagues: "This is a golden opportunity to resolve this problem once and for all... It is very frustrating for skipper and their crews to have to discard beautiful, high-quality fish." Of course the quota system was introduced by the EU to protect threatened fish stocks. But what no-one predicted was that it would result in so much waste of such a valuable resource. And now environmental groups including the WWF and the RSPB agree that discards are unacceptable and are supporting moves by the Scottish fishing industry to make changes. The Scots will now hope that their complicated "cocktail" of measures, which include using more sophisticated nets and closing some areas of the sea to fishing boats, will meant that less fish is caught - but more fish is landed. And that means a reduction in the amount being dumped. The proposals will be put to the European Union later this year.